At least, that’s what we’ve always been told, right? Well, Marvel Entertainment are finally taking steps that show they realize those statements to be a load of codswallop (after all, no movie hits $1 billion in ticket sales if only boys/men are watching it, am I right?!). In the last two weeks we’ve had the first poster and trailer for the first female lead film in the Marvel Cinematic Universe, Captain Marvel, the official announcement that Marvel Television will develop their own female driven television series for ABC Television, and the rumor from Variety that Marvel Studios are developing a series for the upcoming Disney Streaming service focused on Elizabeth Olsen’s version of Scarlet Witch. And tonight, Disney XD will be take the first step on this mission to given young girls, and women, a voice in the world of Superheroes with Marvel Rising: Secret Warriors. The film (that it is believed will lead to either more films or series) focuses largely on the story of Ms. Marvel (aka Kamala Khan, voiced by Kathreen Khavari), and Squirrel Girl (aka Doreen Green, voiced by Milana Vayntrub), two best friends who are trying to find their way in the world, and make a difference with the powers they’ve been given, all while being two teenage girls just trying to grow up. In their exploits they’ll be joined by Quake (aka Daisy Johnson, voiced by Chloe Bennet), America Chavez (voiced by Cierra Ramirez), Patriot (aka Rayshaun Lucas, voiced by Kamil McFadden), and Inferno (aka Dante Pertuz, voiced by Tyler Posey) as they form a young superhero team, under the tutelage of Captain Marvel (aka Carol Danvers, voiced by Kim Raver). 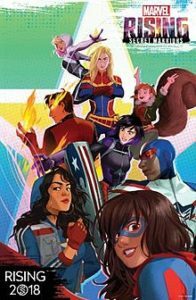 In creating Marvel Rising: Secret Warriors, EPs Cort Lane, Sana Amanat, and their teams at Marvel Entertainment met with young girls to see the kind of stories they wanted to see reflected in a series aimed entirely at them, and the kinds of characters they wanted on screen. The result is delightful. Having watched the film twice last week (once in preparation for the red carpet, and then again only hours later when invited to stay for the screening. To which I said yes, because it was great), I can say that I am already chomping at the bit for more. Marvel Rising: Secret Warriors is a delightful story about growth, and coming of age, that will delight both the young girls to whom it is aimed, and the boys and adults who are sure to see it as another delightful story for its own sake. We were lucky enough to get to speak to stars Khavari, Vayntrub, McFadden, Posey, and Booboo Stewart (voice of Exile), as well as EPs Lane and Amanat about the series, their hope for the future of representation on screen, and taking the first step in Marvel’s on screen effort to bring girls and women into the forefront, finally. Check out the interviews below, and make sure to tune in to Marvel Rising: Secret Warriors tonight on DisneyXD.